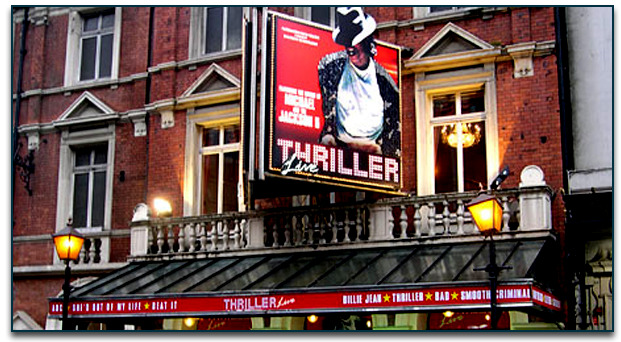 The mesmerizing magic of feel good London show, Thriller Live can be enjoyed at fullest at the Lyric Theatre. The heart warming and sensational show features some of rge amazing choreographers and performers from all across the world. Some of the amazing dancers of the world have performed the rocking musical numbers of Michael Jackson.. Lyric Theatre is one of the popular London Westend Theatre positioned on Shaftesbury Avenue in the city of Westminister. The theatre has been designed by architect C J Phipps. After churning a super duper blockbuster hit Dorothy by Alfred Cellier and B C Stephenson, producer Henry Leslie invested all its profits in building Lyric Theatre. In the year 1932-33, the foyers and bars had been refurbished, whereas façade had been restored in the year 1994. The current occupancy of the theatre is 967 and spread across the four levels. The original capacity of the theatre was 1306. Interestingly, electric pump for the function of iron curtain is still used in the theatre. .
History of the lyric theatre holds comic operas, musicals and straight dramas. To retain the old magic, theatre has some of its original features. On September 1960, English Heritage listed theatre under Grade II building. Some of the popular productions of Lyric Theatre are Dorothy, Doris and The Red Hussar, The Mountebanks, His Excellency, The Sign of the Cross, Florodora, The Duchess of Dantzic and many more. So, catch the enthralling London musical, Thriller Live having great productions values and brilliant dance performances at the Lyric Theatre. You can book online tickets now and avail an exciting discount package of 70%. We offer safe and secure booking with seat allocation made before the payment done. All booking will be done from the official STAR agent Websites.